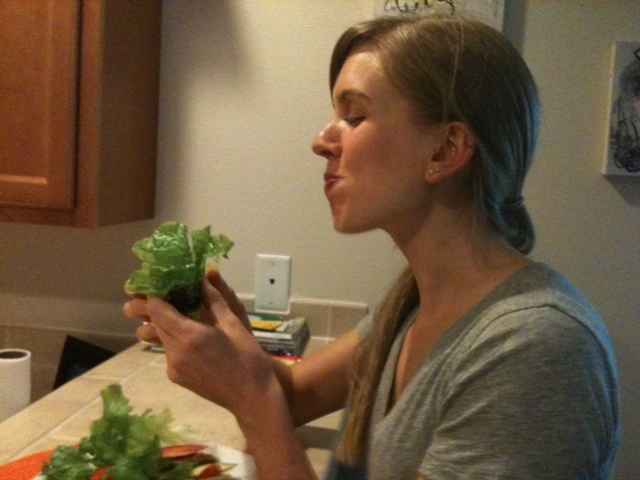 First off, a shout out to blogger, My Food Religion for posting this great recipe. I stumbled upon it earlier today while perusing other blogs and knew it was going to be on the menu for tonight’s dinner. It’s a no-brainer and super quick (minus figuring out the Celsius to Fahrenheit conversion part). I modified it slightly by dipping the chicken in beaten egg prior to coating it in the seasoning/flour mixture. In my experience, I feel like it helps the coating get crispier. I also baked the tenders at 400 degrees F, rather than the suggested 180 degrees C (356 degrees F) to ensure crispiness on the outside. The meal turned out delicious and the chicken tenders were moist, flavorful and crispy on the outside, which made for fantastic tacos! 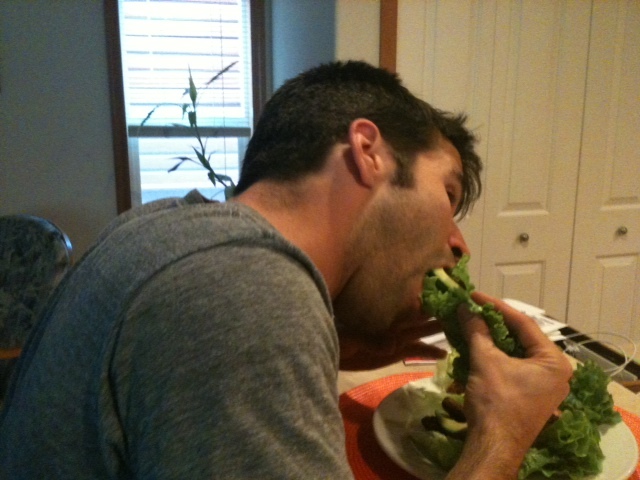 As you’ll see below, Jesse and I gobbled them right up! Mix taco seasoning and almond flour in a mid-size bowl. In a separate bowl, beat the egg and mix in 1/2 Tbsp water. 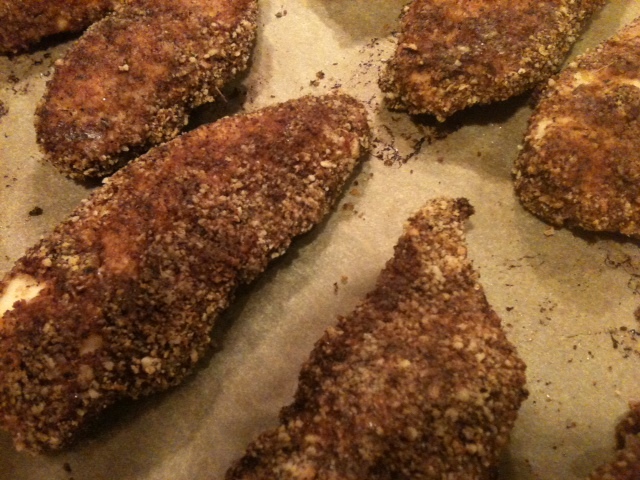 Dip chicken tenders in the egg and then roll in seasoning/flour mixture until coated thoroughly. Place on baking sheet. Bake for 20 minutes or until coating is crisp and chicken is cooked, flipping halfway through. 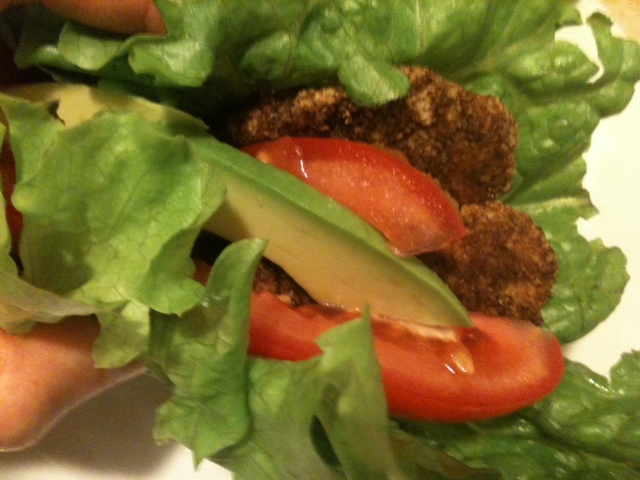 Separate tenders into lettuce leaves and garnish with avocado and tomato slices. Absolutely! Gotta give credit where credit is due 🙂 Thanks for sharing the wonderful recipe.